We’ve just added a new feature in The Hub, our member dashboard, which we think you are going to like: the ability to update all of your plugins and themes from the one easy dashboard, and not just WPMU DEV ones! So now, in order to manage updates (or, in fact, update every single plugin and theme on every single one of your sites) all you have to do is visit the “My Websites” section of The Hub and click away! Update everything – all of your plugins and themes – in one go in just one click. Which, in turn, will run through every site you manage applying updates to every theme and every plugin on them, whether they are from WPMU DEV or not. Now, of course, a lot of people won’t be comfortable with updating everything just like that. Now you don’t need to login to each and every one of your sites to make updates – just click Update Everything and The Hub will do it all for you. So, if there are any problems, it’s super easy for you to roll back your sites, all from within the comforts of The Hub, and give it another whirl. Oh, and if (like me) you generally trust updates not to break your site you just saved yourself hours of trawling through every site you own and applying updates to all of your plugins and themes. Security Scanning and Performance Monitoring, Too! So just in case you’re not familiar with The Hub, not only do you get to manage all of your plugin and theme updates, but you also get a whooooole lot more. For example, let’s start with security, powered by WP Defender and right there in at your fingertips for every site you manage. 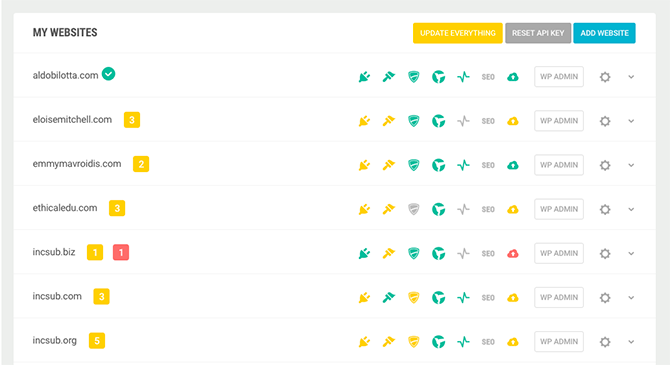 Monitor the security of all your site from The Hub. As you can see, this site has been hardened and scanned just the other day, is not on any blacklists, and is keeping a full audit log of every event under the sun (most of which are naughty hackers trying to log in with scraped author names and easy passwords). Every week WP Defender will scan the site again for you, every six hours it will check the blacklists and if any new hardening is required… you’ll find out all about it in The Hub. Keep your sites humming along at top speed with Hummingbird in The Hub. And, if that isn’t enough to keep you in Google’s good books, we’ll also make sure your site is performing at its absolute best too. Now, granted this one isn’t so great (it’s my local football club, Google doesn’t matter that much so I’m a bit slack) but as you can see, without improving server time or doing too much minification (which Hummingbird will totally sort you out with, FYI) I’m not doing too badly. I can review, re-scan and improve the performance of each of my sites, all in the one place! And if you didn’t, hey, click that Free Trial link in the navigation above and you can find out today, for free (no obligation, no lock in, easy one-click-cancel), so why not give it a shot? And regardless, we really hope you enjoy the latest evolution of our very own WordPress site management setup, and we’d love to hear any feedback or requests for new features that you’d like to see in the Hub… so please pop below to the comments and let us know!